Families ask mine owners Why? 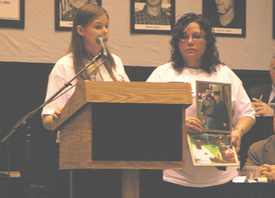 BUCKHANNON, W.Va. — “We will not allow you to leave any stone unturned to find out why my husband died,” said Samantha Lewis, pointing her finger directly at elected officials at a May 2 hearing here on the Sago Mine disaster. On Jan. 2, 12 Sago miners went to work and never came home. They were trapped for 41 hours and only one survived. International Coal Group (ICG) believes things are back to normal as coal pours out of their Sago mine. But just up the road, nothing is normal for over 60 surviving family members who filled the gym of West Virginia Wesleyan University along with members of the United Mine Workers of America, elected officials and a small army of media. It was a first in mining country — a public hearing where family members got the chance to question a coal company about a mining disaster. “Historically, investigations of mine disasters in the United States have never involved the families of the victims,” said Davitt McAteer, former federal Mine Safety and Health Administration (MSHA) undersecretary. “That era ends today.” McAteer is now special adviser to West Virginia Gov. Joe Machin. The hearing investigating the cause of the Sago disaster was right on time. The first four months of 2006 have been the most deadly in 40 years for the men and women who keep the nation’s lights on and its steel rolling. With the April 21 deaths of Kentucky miners Rick McKnight, 45, and David Chad Bolen, 28, this year’s mine death toll already stands at 26, more than in all of 2005. At the May 2 hearing, not even Gov. Machin could get ICG to agree to allow union president Roberts to speak, or even ask questions. Sago is a nonunion mine and ICG continues to challenge the federal law which allows the UMWA to represent miners in a safety investigation whether they are members of the union or not. MSHA and a special committee from the West Virginia Legislature also participated in the precedent-setting hearing. Roberts and members of the state Legislature could write their questions on cards, but could not directly address mine inspectors or the company. Sago family members, however, could. Virginia Moore was to marry Terry Helms in July. Helms, the only miner to die in the initial blast, was a fire boss, one of two miners who inspect the mine for gas and other hazards before a production shift starts. His record for Jan. 2 was never recovered. Moore wanted to know why it took so long for rescue workers to arrive. All wanted to know what happened to the records of the second fire boss, Fred Jemison. Under oath, Jemison said he lost his log for Jan. 2. He sat on the panel with nine company officials, including ICG president Bennett Hatfield. “These miners have no voice,” UMWA Local 1570 President John Palmer told the World. “I would like to take them all to where I work and let them compare. The union makes all the difference, it gives you a voice. If you are organized, you can protect yourself and your co-workers.” At a union mine, miners cannot be fired or disciplined for questioning health and safety conditions. They can review company plans, especially safety devices. Palmer stood with UMWA members who all agreed that ICG danced around families’ questions and questions from MSHA. “After nearly eight hours, they haven’t answered one question straight yet,” he said. Gov. Machin promised a full report by July 1.